Jessica is our front-end gal, 4 – 5 days a week, in Edgemont Village. She’s developed quite a following with the North Shore crafters, she has an effervescent personality and her enthusiasm for the fibre arts is infectious! 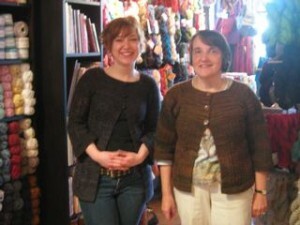 Last Fall, Jess begged us to let her run some Knit Nights and they’ve been wildly successful. On a recent Tuesday evening there were fourteen ladies crammed into our little Edgemont store, chit chatting, needles clickety clacking, all having a marvellous time. Jess used Araucania Nature Wool and Teresa used Malabrigo Merino Worsted. Well done ladies, they’re beautiful! Next up is the Mr. Greenjeans cardi. This sweater’s slightly cropped, with a single button closure and a cable pattern that’s easy enough for your first cable project. Six knitters cast on last Tuesday evening and for a couple of them, it’s their first sweater ever. If you’d like to join the Mr. Greenjeans Knit-Along, it’s not too late, just give Jessica a call at 984-2214. She’d be happy to help you out. This entry was posted on Thursday, April 16th, 2009 at 2:14 pm	and is filed under Uncategorized. You can follow any responses to this entry through the RSS 2.0 feed. Both comments and pings are currently closed.